My kids better be at least half as funny as yours. Love him. "Sweet dreams are made of these. Who am I to disagree?" There must have been something in the air last night. My little man tried to climb in bed with me twice last night. But the question is, did he really want a sandwich or is it some kind of code word? I'm pretty sure we had the same dream last night. This is the most darling post EVER! My 6 year old son, who loves construction as much as Bob loves Star Wars, often mumbles directions for digging holes when I kiss him at night. This feline is just so lovely. 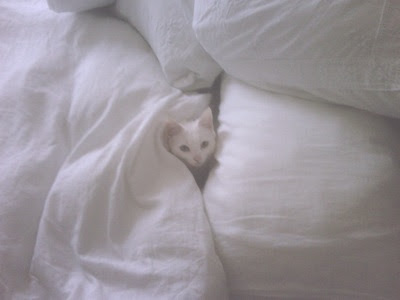 Tucked in between the white sheets - it's such an endearing photo. What's the name f this cute, little bundle of joy?